Samra Zafar inspires as the University of Toronto’s youngest alumni governor. For more than 10 years, Samra Zafar endured abuse from her husband while raising her two daughters and searching for a way out of a forced marriage. It was under these circumstances that she saved enough to start her degree at the University of Toronto. 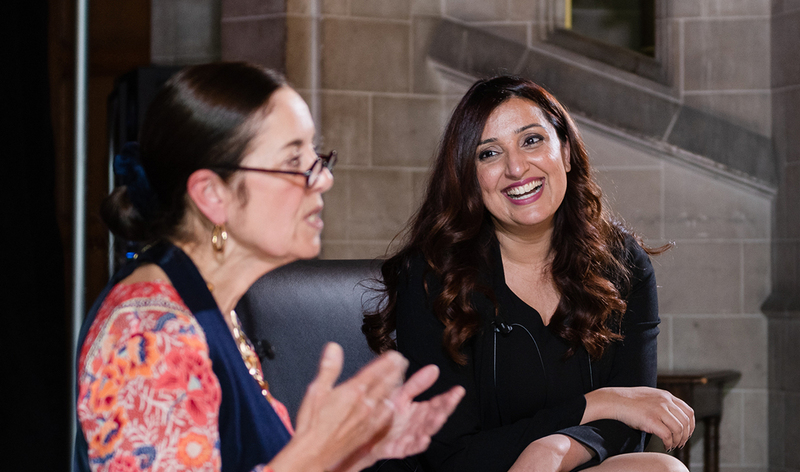 Zafar was eventually able to move out and live on campus with her children, earning a BSc at U of T Mississauga in 2013 and graduating with a master’s degree in economics from U of T a year later. A brilliant student, Zafar received more than a dozen awards and scholarships, becoming the first woman of colour and first mature student to capture the John Moss Award, an alumni association scholarship that was established almost 100 years ago with an endowment created with gifts from individual alumni. Despite her busy life as a single parent and diligent student, Zafar was inspired by the help she received in completing her degree at UTM and paid it forward. “I started volunteering even before I graduated,” she says. “I would take a few hours every week to go and volunteer at the UTM accessibility centre, where I started working with a blind student who was 65 years old and in a wheelchair. She was completing her degree with distinction. Since graduation, Zafar has embarked on a commercial banking career with RBC and founded Brave Beginnings, a non-profit that provides support and mentorship for women who have experienced oppression. She also serves as the University’s youngest alumni governor, drawing on her personal story to empower others to change their own lives and make positive contributions to the lives of others through advocacy and non-profit engagement.